Finally! 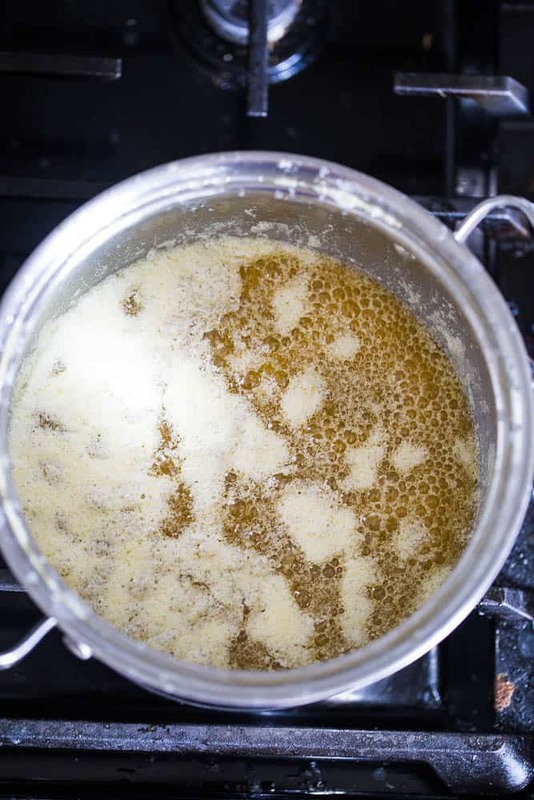 How to make ghee! I’m not sure why it took me so long to post this. Wait — I do know. It’s because 90% of the time my stove is dirty. And this tutorial needed pics over a stove. I should just have just owned it and posted pics in all of its splattered, crumbly glory. Anyway, if you don’t know how to make ghee, you’ll love this. What’s ghee? 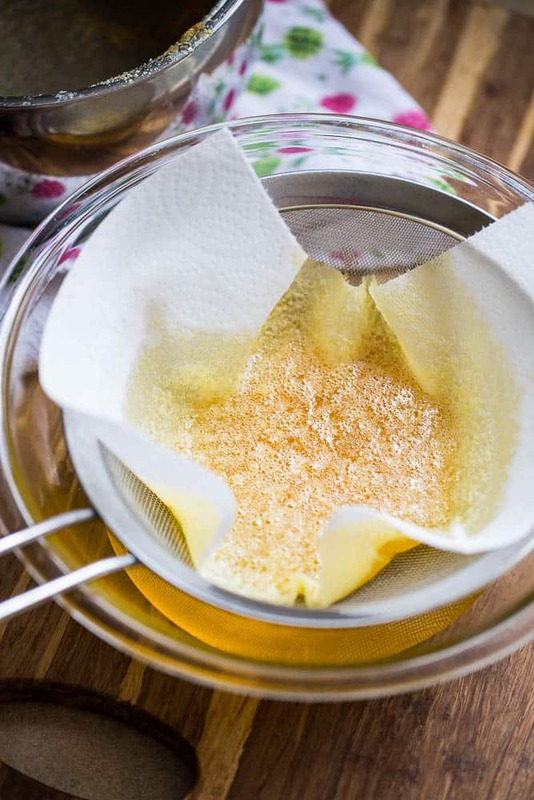 Ghee is butter that has had its milk solids removed. Don’t be scared. It’s a lot easier than it sounds. 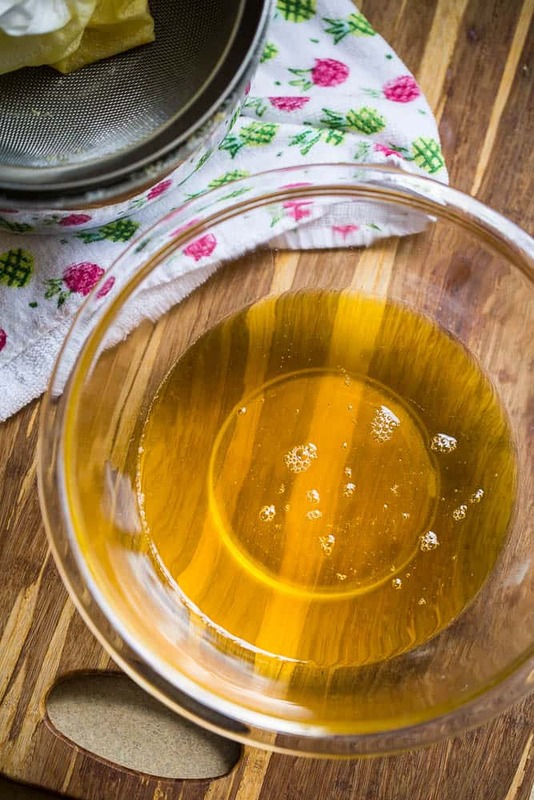 What’s the benefit of using ghee? Nutritionally speaking it’s similar to butter, but since there are no milk solids, it may agree with you more if you’re sensitive to dairy. The biggest benefit for me is that you can cook ghee at a higher temperature than you can butter since it’s the milk solids that tend to burn. 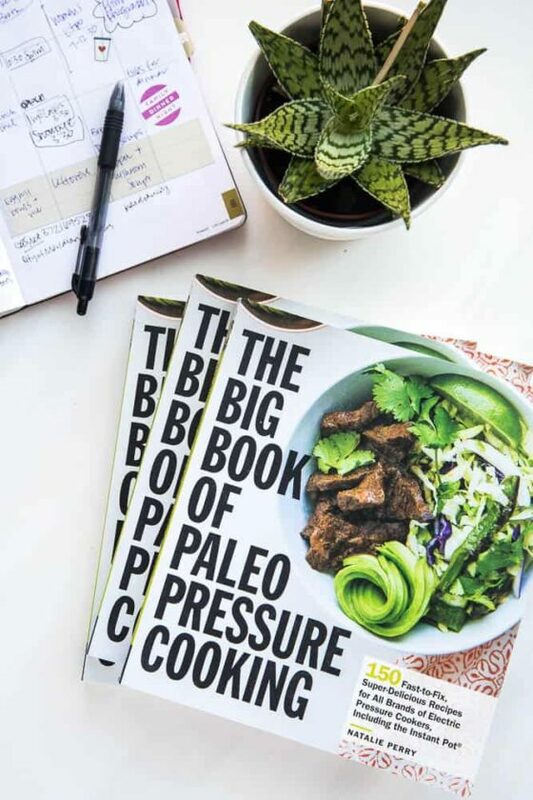 SO, you can get the flavor of butter (more like, browned butter) with the versatility of avocado or coconut oil! Roasting vegetables in ghee is a game changer. Also, ghee is Whole30 compliant. Butter is not. Technically you an use any kind of butter for this, but if you want ghee that will knock your socks off, use grass-fed butter. 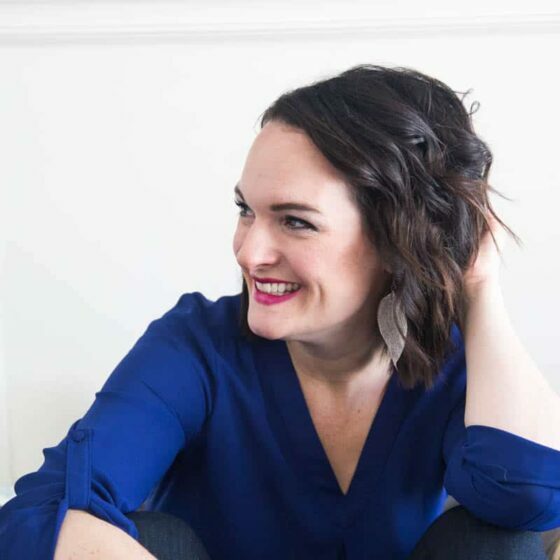 I love Kerrygold butter — especially for this. 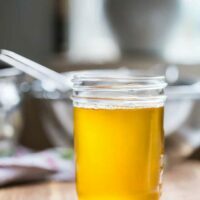 It makes such rich, flavorful ghee. You can also use whatever amount of butter you like. For this recipe, I used a pound. Cooking time will depend on how much butter you use, but the process is still the same. 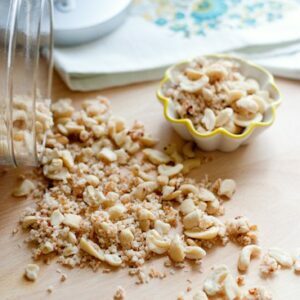 Cut the butter into chunks and put them in a saucepan. Or if you’re like me, throw it in there whole because you forgot to cut it, and then hack at it with a butter knife to break it up. Honestly, it doesn’t matter if it looks like a 2-year-old cut it because it’s all getting melted anyway. 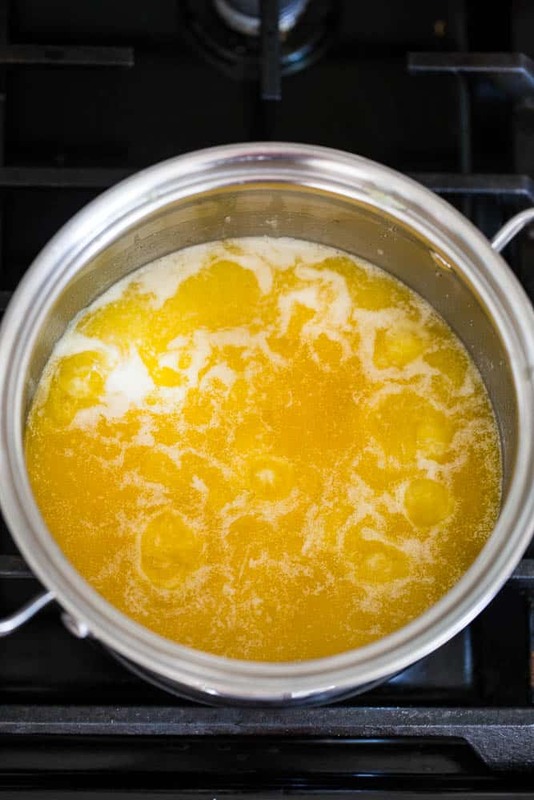 Turn the saucepan to medium-low heat and melt the butter slowly. When it’s melted, just let it gently simmer. It shouldn’t boil rapidly or else it’ll burn. If it starts to splatter and bubble really big, turn the heat down. Oh, and DON’T STIR IT. After a few minutes a thick, chunky foam will form on the top. This is good. Just let it keep simmering. AND DON’T STIR IT. After about 15-20 minutes you’ll notice the foam begin to dissipate. The butter will turn from cloudy to clear, too. That chunky foam won’t all go away completely, but you’ll see spots begin to clear on the surface. And, just a reminder, don’t stir it. I know you’re probably tempted, but what’s happening is the milk solids are falling to the bottom of the saucepan and you don’t want to kick them up and mix them around again. After another several minutes, you’ll see a finer, “fizzy” looking foam begin to form. This is your signal that you’re finished simmering! Turn the heat off and let the pot sit until it stops bubbling. 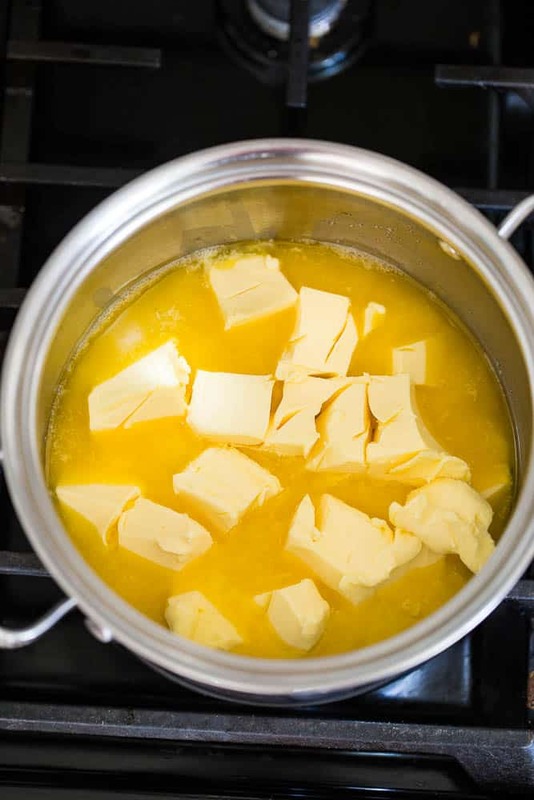 So, the butter should simmer about 25-30 minutes total for 1 pound of butter. And you don’t even have to stir it. Just keep an eye on it. Now it’s time to strain it. Get a medium size bowl and put a fine-mesh strainer inside of it. I like this set of three strainers. I use them all the time. Put a paper towel over the top of the strainer, too. 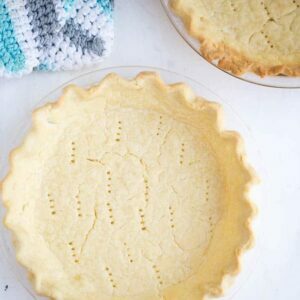 Pour the butter into the paper towel-lined strainer and get all of those milk solids strained. You may have some stuff stuck to the bottom of your pan, but if you let it soak for a few hours it cleans up really well. Discard the stuff in the paper towel, letting as much ghee drizzle out as you can. You should only have a couple tablespoons worth of milk solids in there. Et voila! Ghee! Isn’t it pretty? At this point you can transfer it to a lidded container — it actually fits perfectly in a pint-size canning jar. 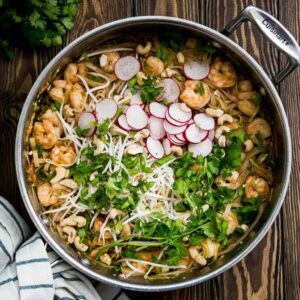 You can leave it on the counter to use for about 2 months or store it in the fridge for up to 6 months. Also, as it cools, it’ll turn opaque and thicken up. Don’t worry, this is normal. 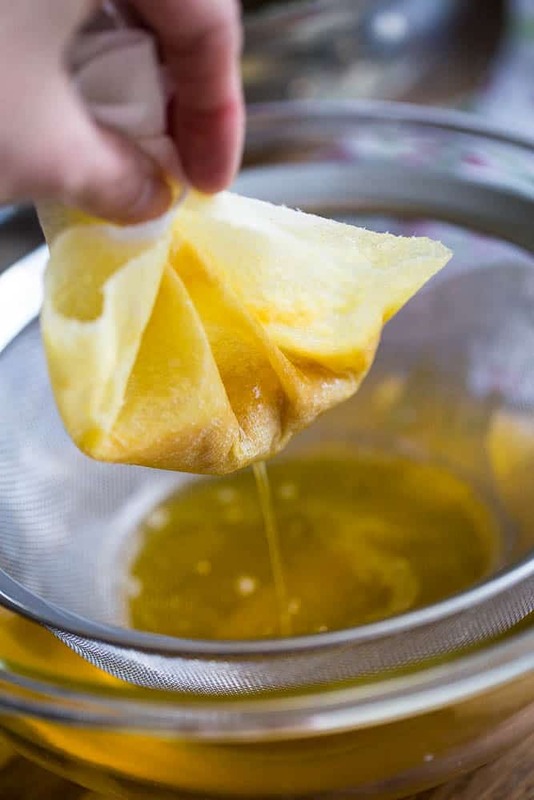 Now, go fry an egg and be forever converted to the nutty, brown-buttery deliciousness that is ghee. 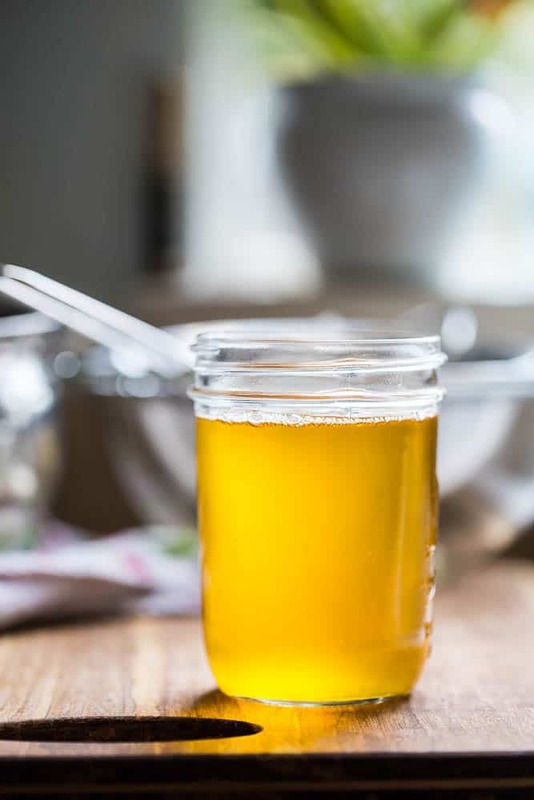 If you've never made your own ghee, it's really easy! Using high-quality butter makes such delicious ghee, too. 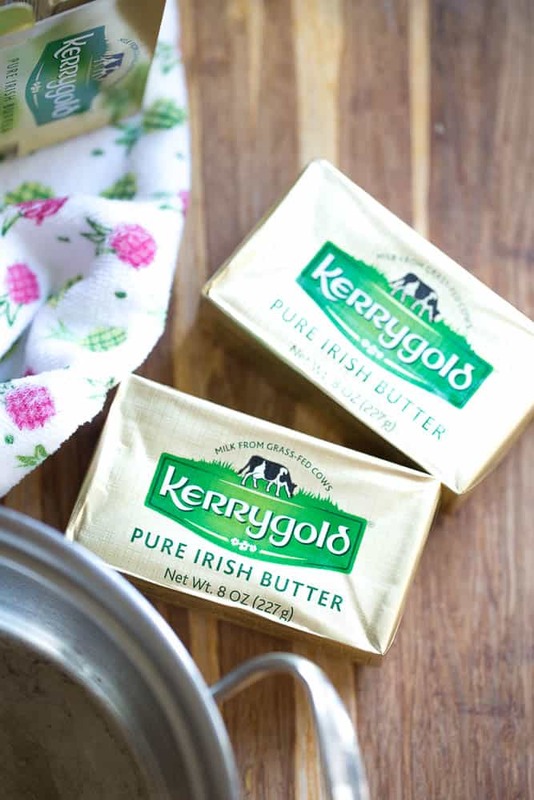 I love using Kerrygold grass-fed butter. 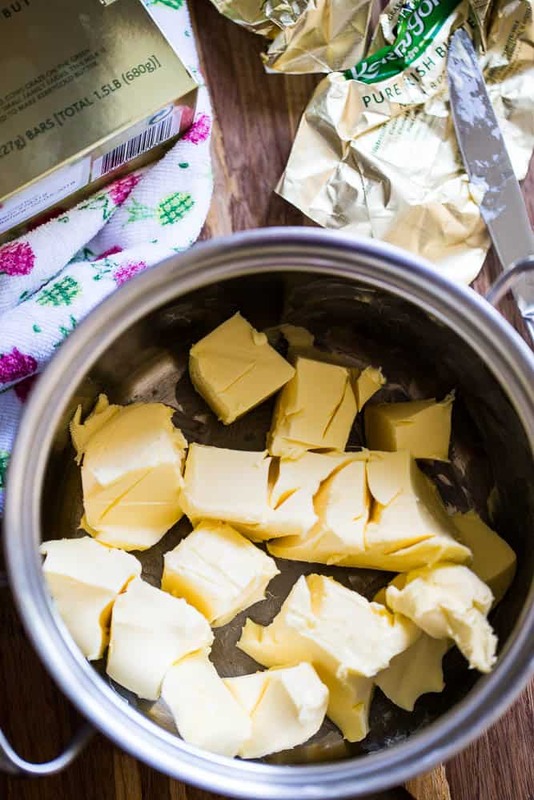 Cut the butter into large pieces and melt them in a medium saucepan over medium-low heat. Let the butter simmer for 20-25 minutes. If it starts to bubble or splatter too much, turn the heat down to low. The butter will form a thick foam on top for most of that time. 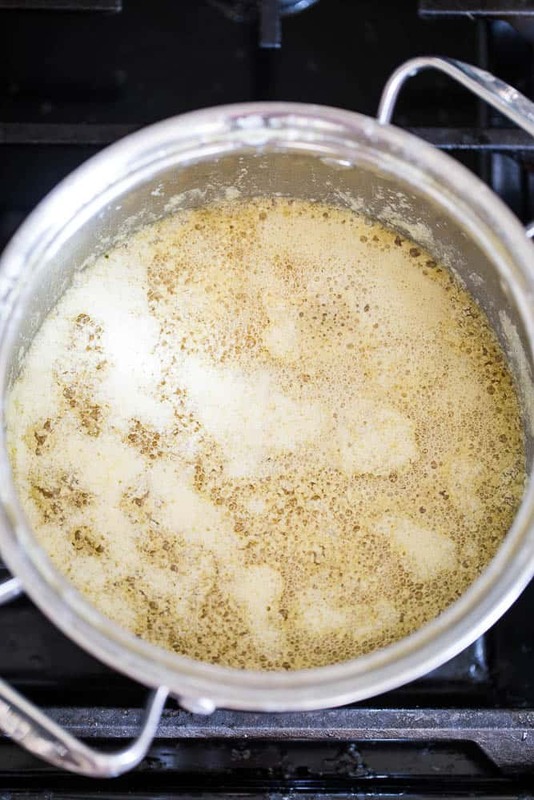 As it simmers, the thick foam will begin to subside and then a few minutes later a more fine, fizzy-looking foam will start to form. This is your signal to remove the butter from the stove. Let the butter cool until it stops bubbling. Meanwhile, prepare to strain the butter by nesting a metal, fine-mesh strainer in a medium bowl. 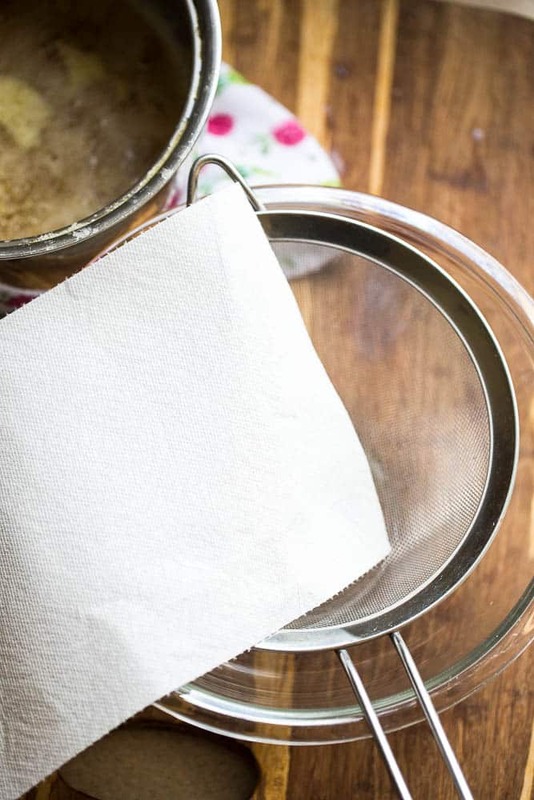 Lay a paper towel in the strainer. Pour the butter through the paper-towel lined strainer to strain the milk solids from the butter. Voila! Ghee! Pour the ghee into a lidded container. It fits perfectly in a pint-sized mason jar. You can store it at room temperature for about 2 months or in the fridge for 6 months. Great tutorial! I saw ghee at Costco and couldn’t get over the price. Totally going to just make it. 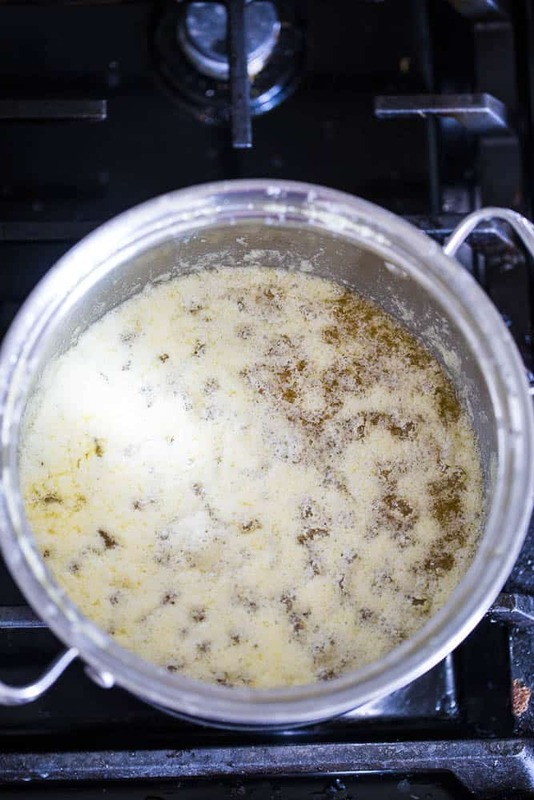 You could strain it early, but it will be harder to get all of the milk solids out of the butter. Honestly, I think it would be have at least a little of that nutty browned butter, though.